Unbeaten ex-Olympic gold medalist in the middleweight category, WBC#4/IBF#5/WBO#9/WBA#12 Ryota Murata (8-0, 5 KOs), Japan, will take on Argentine veteran Gaston Alejandro Vega (24-10-1, 10 KOs) in Shanghai on January 30. It was announced by Teiken Promotions on Friday. Having unanimously decisioned Gunnar Jackson in Las Vegas last November, Murata is gunning for a shot at a world championship in the near future, for which the Japanese prospect, 29, is hoped to show a good performance in the event promoted by Top Rank. 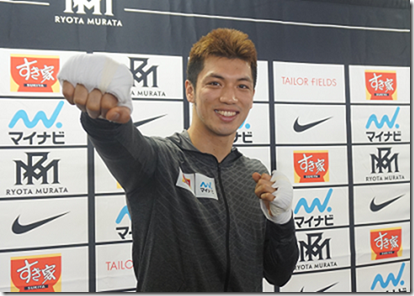 Murata says, “I’d like to positively fight and wish to display a satisfactory showing.” The headliner of the show will be two-time gold medalist Shiming Zou, who will meet undefeated Brazilian Nathan Santana Coutinho over twelve rounds.